Legends about Saint Patrick abound. The truth is best served by seeing two solid qualities in him: he was humble and courageous. The determination to accept suffering and success with equal indifference guided the life of God’s instrument for winning most of Ireland for Christ. Details of his life are uncertain. Research places his dates of birth and death later than earlier accounts. Patrick may have been born in Dunbarton, Scotland, Cumberland, England, or in northern Wales, in the year 387. He called himself both Roman and a Briton. At 16, he and a large number of his father’s slaves were captured by Irish raiders and sold as slaves in Ireland. Forced to work as a shepherd, he suffered greatly from hunger and cold. After six years, Patrick escaped Ireland, probably to France, and later returned to Britain at age 22. His captivity had meant spiritual conversion. He may have studied at Lerins, off the French coast. He spent years at Auberry, France, and was consecrated bishop at 43. 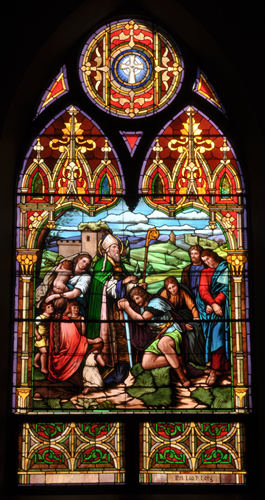 His great desire was to proclaim the Good News to the Irish. In a dream vision, it seemed “all the children of Ireland from their mothers’ wombs were stretching out their hands” to him. He understood the vision to be a call to do mission work in pagan Ireland. Despite opposition from those who felt his education had been defective, he was sent to carry out the task. He went to the west and north, where the faith had never been preached, obtained the protection of local kings and made numerous converts. Because of Ireland’s pagan background, Patrick was emphatic in encouraging widows to remain chaste and young women to consecrate their virginity to Christ. He ordained many priests, divided the country into dioceses, held Church councils, founded several monasteries and continually urged his people to greater holiness in Christ. He suffered much opposition from pagan druids– a member of a pre-Christian religious order among the ancient Celts of Gaul, Britain, and Ireland and was criticized in both England and Ireland for the way he conducted his mission. In a relatively short time, the island of Ireland had experienced deeply the Christian spirit, and was prepared to send out missionaries whose efforts were greatly responsible for Christianizing Europe. Patrick was a man of action, with little inclination toward learning. He had a rock-like belief in his vocation, in the causes he had supported. One of the few certainly authentic writings is his Confessio, above all an act of homage to God, for having called Patrick, unworthy sinner, to the apostolate. There is hope rather than irony in the fact that his burial place is said to be in County Down in Northern Ireland, long the scene of strife and violence. What distinguishes Patrick is the durability of his efforts. When one considers the state of Ireland when he began his mission work, the vast extent of his labors (all of Ireland) and how the seeds he planted continued to grow and flourish, one can only admire the kind of man Patrick must have been. The Feast Day of Saint Patrick is celebrated on March 17, popularly known as St. Patrick’s Day, is believed to be his death date and is the date celebrated as his Feast Day. The day became a feast day in the Catholic Church due to the influence of the Waterford-born Franciscan scholar Luke Wadding, as a member of the commission for the reform of the Breviary in the early part of the seventeenth century. For most of Christianity’s first thousand years, canonizations were done on the diocesan or regional level. Relatively soon after the death of people considered very holy, the local Church affirmed that they could be liturgically celebrated as saints. A Pope has never formally canonized St. Patrick; nevertheless, various Christian churches declare that he is a Saint in Heaven (he is in the List of Saints). He is still widely venerated in Ireland and elsewhere today. More recent scholarship suggests its author was anonymous. In any case, this prayer certainly reflects the spirit with which St. Patrick brought our faith to Ireland! When St. Paul referred to putting on the “Armor of God” in his letter to the Ephesians (6:11) to fight sin and evil inclinations, he could have been thinking of prayers just like this one! We may not wear combat gear in our daily lives, but St. Patrick’s Breastplate can function as divine armor for protection against spiritual adversity.